The mailbox delivers the green– for consumer and marketer alike. We are having an outrageously good time with store coupons. As we exit the mall, it takes a 50-pound anchor tied to our belts to stop us from running frantically, eyes over our shoulders, across the parking lot to our get away car. 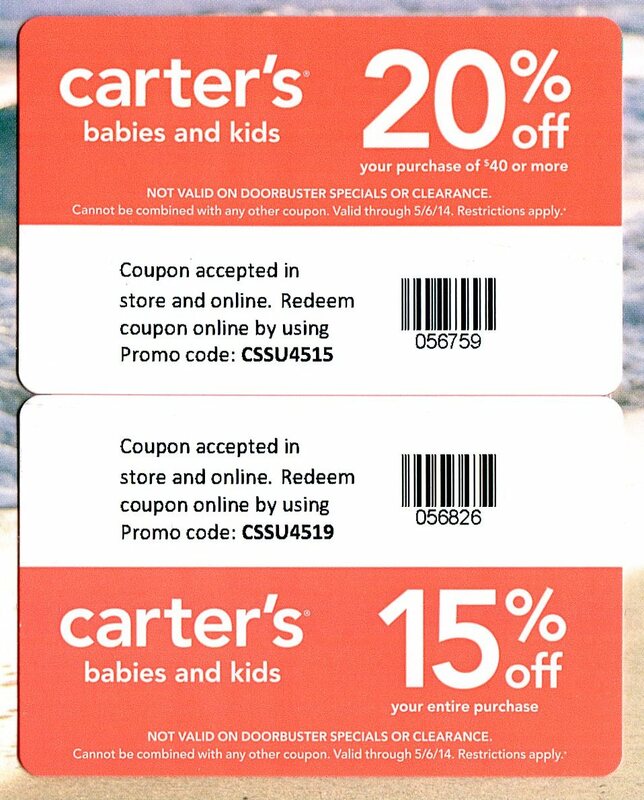 Carter’s throws in a 20% discount for a $40 purchase. And another– 15% off everything, period. 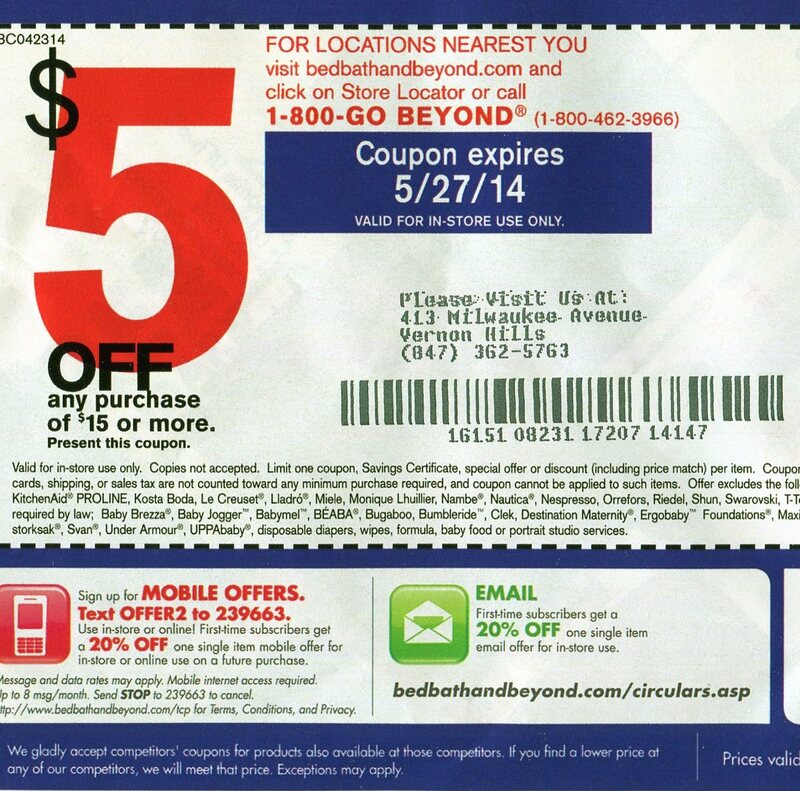 Bed Bath & Beyond churns out $5 coupons faster than the U.S. Treasury, which is saying something. Ulta hands us $3.50 just to spend $10. We have enough conditioner for the entire cast of Muppet Movie 3. BBBY coupons come so quickly we have to bale them. 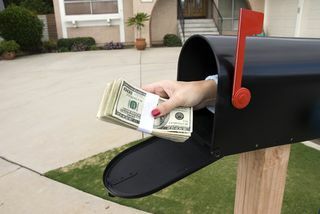 For some, coupons are clutter in the mailbox. For many, they reveal how weak we really are. Despite our supposed disdain for direct mail, we read each coupon carefully…. and then sneak into the store late Sunday night with a fistful, and a bag over our head. ‘Just can’t spend the coupon fast enough. 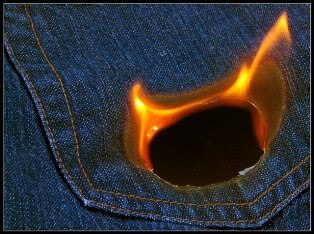 At our house, coupons are incendiary devices, capable of exploding into flames when placed in the pocket. 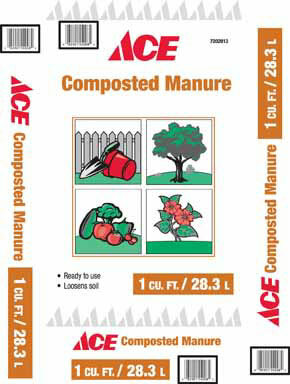 For instance, I am mailed a $5.00 rebate card from ACE Hardware. 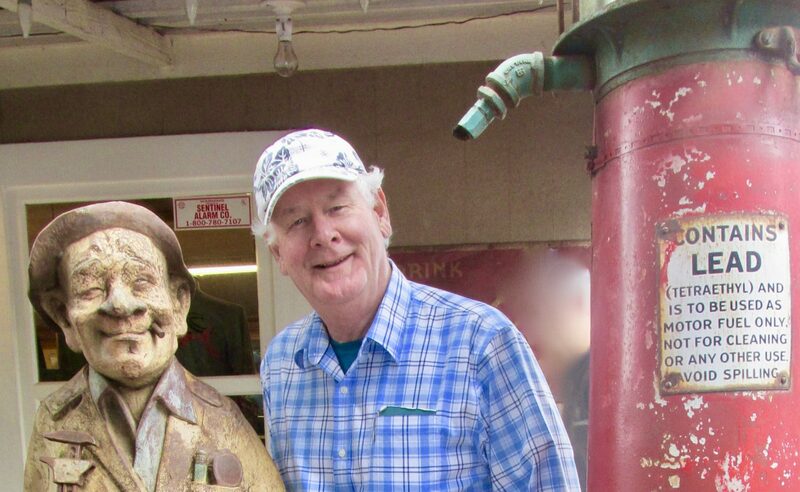 The card sits between the salt and pepper shakers, Tasering me to rise from my chair, go to ACE and buy something, even a bag of sheep manure, just to use the money. My wife is a coupon maven. She gets the deal, but escapes the accompanying load-up the marketer hoped for. For instance, that $10 cash gift from Kohl’s? She tenders it, usually on a $20 item marked down to $10.00. “Look honey:” she beams, “7 pairs of underwear, for nothing!” Totally void of guilt. Butter would not melt in her mouth. So how does the retailer really fare with these incredible deals? Not bad, if you look at the right numbers. CouponCabin.com does an excellent job of capturing all the publicized deals of a retailer. It spins them back to any shopper savvy enough to ask for them online. 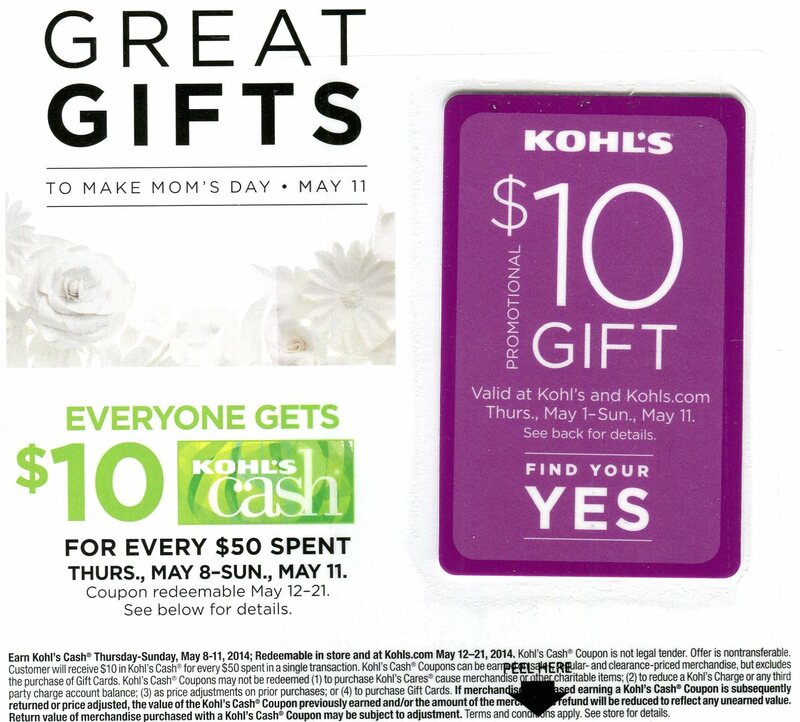 The company regularly totals results, and in the case of Kohl’s, reports the average shopping cart is $66.43 before $18.04 in coupon savings. A 22% discount. That’s a promotional cost, and it comes out of gross profit. January 2014 Kohl’s gross profit margin was 36.49%….. 7 and 11 points better than Target and Walmart respectively. Kohl’s cost of goods (COGS) was 63.51%. So are the Kohl’s people nuts, or is this normal business to throw gobs of money out the window? It boils down to how much Kohl’s will pay to get an extra visitor into the store. Bottom line: a profit with every sale. Say they mailed a 1,000,000 coupons, and 15% were redeemed. 150,000 purchases! But set aside 30,000 purchases for those folks who would have bought the items anyway. So the mailing generated 120,000 additional transactions, each with a shopping cart of $66.43. That’s $7,971,600 in extra sales. But the 22% discount takes away $2,164,800. And subtract the mailing cost of $320,000. Kohl’s is left with $5,486,800 cash to pay for the goods sold: $5,062,763 ($7,971,600 x 63.51% COGS). 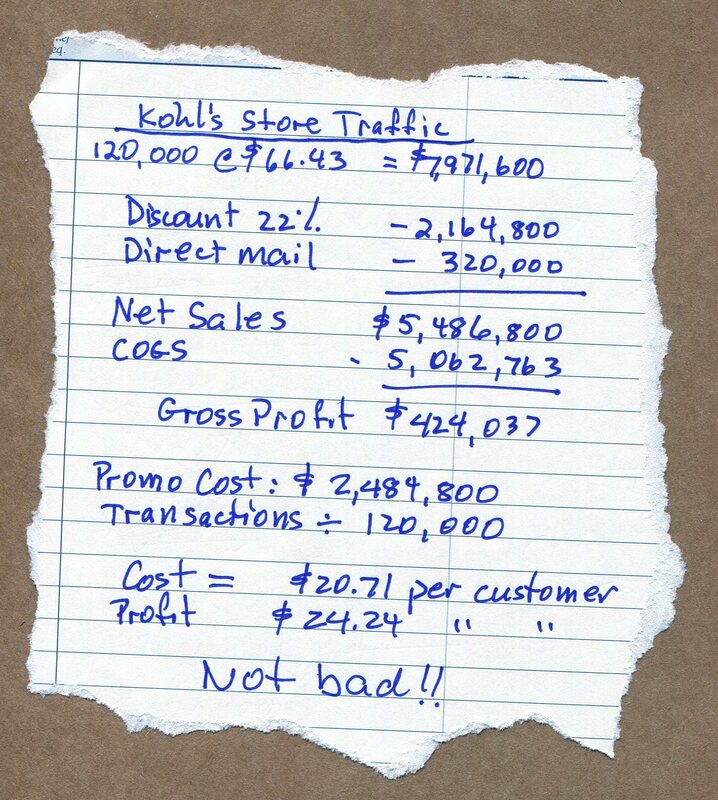 Bottom line, Kohl’s promotion cost $2,484,800 and delivered $424,037 in extra profit. That is a 17.1% ROI. Not bad. You can’t run your whole business that way, but to generate extra sales and margin, still a pretty good day. And here’s another perspective: the promotion delivered 120,000 extra store visits at a cost of $20.71 each. And because the gross margin on each cart was $24.24 ($66.43 x 36.49%), Kohl’s did better than break even. So that is why you find oodles of deals in your mailbox every week. They work! And my bottom line? 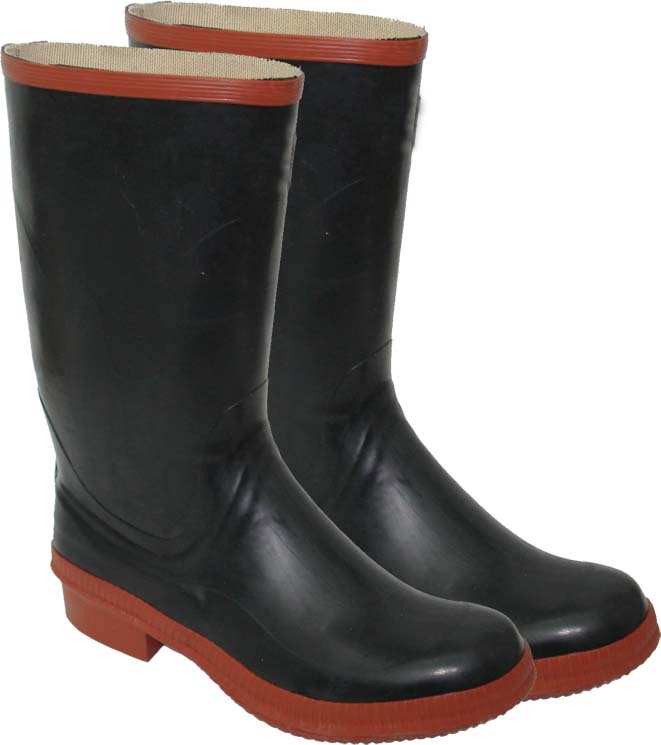 I am looking for a deal on rubber boots. To spread the sheep stuff. If you got this far, I hope you took in all the math. As with all retailers, these are big, scary numbers. But well targeted direct mail makes them work. Please share this article if you liked it! Thanks.